Western Maryland College began in September of 1866, realizing Fayette Buell’s dream of wanting to extend the education of his Westminster Academy students. He enlisted the aid of James T. Ward, a known and respected Methodist Protestant minister, to aid him in his endeavors. Although reluctant at first, because he suspected Buell did not grasp the work and expense such a project entailed, Ward worked diligently on the project. He counseled Buell to be cautious and go slowly as he introduced him to possible benefactors, but Buell still moved forward, buying property and laying the cornerstone for the first building. When money was not forthcoming and enrollment was slow, Buell decided to fold the College back into his Academy. 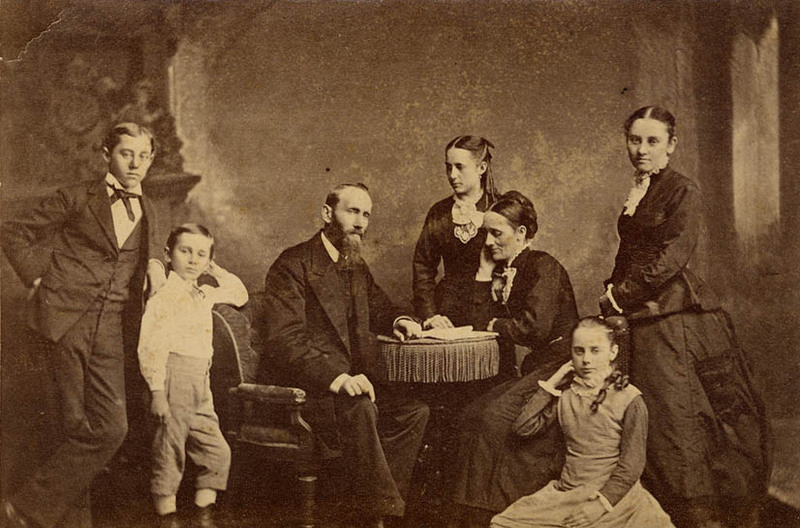 Fayette Buell and His Family, Bachrack Photographers, Baltimore, Maryland, circa 1870. The once reluctant Ward became a champion of the nascent College and encouraged the Board of Trustees to buy the College from Buell, which they did. 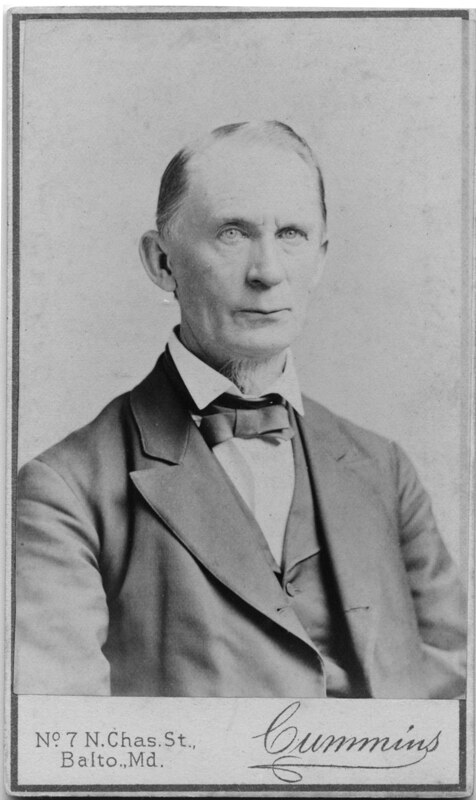 In 1868, Western Maryland College was incorporated, and James T. Ward was elected by the Board as the first president. Ward no longer thought of circulating his library among the townspeople of Westminster, and his books were lent out to students of the College for free. The College advertised this in the first catalogs – “students will have access to libraries comprising 2,500 volumes.” Ward’s library accounted for more than two thirds of the volumes. Students also had access to the collections of their professors’ libraries, and to the magazines, newspapers, and periodicals of their literary societies. 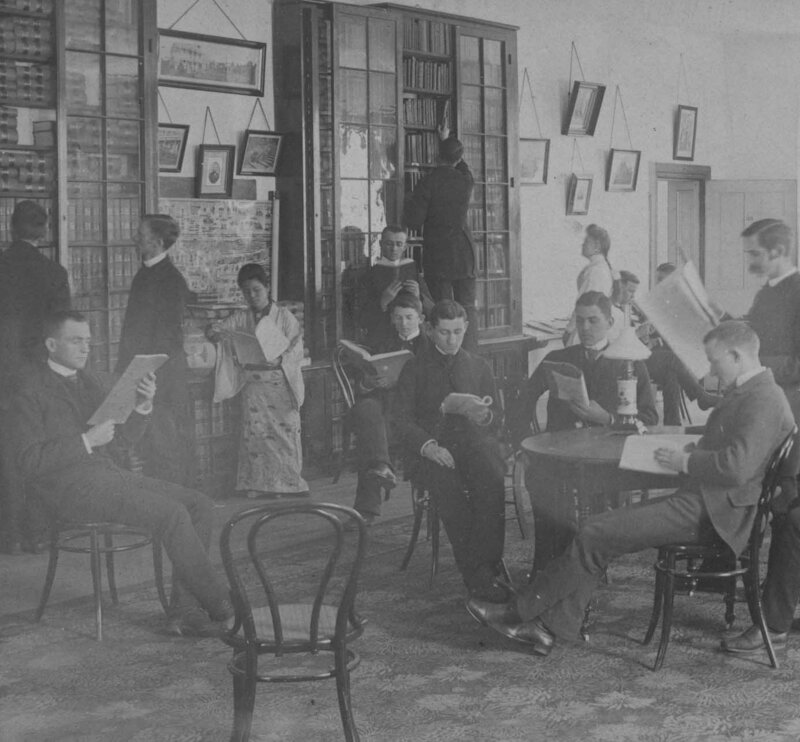 In 1872, the faculty authorized a Reading Room Committee to form an association charged with seeking donations for the College Reading Room. 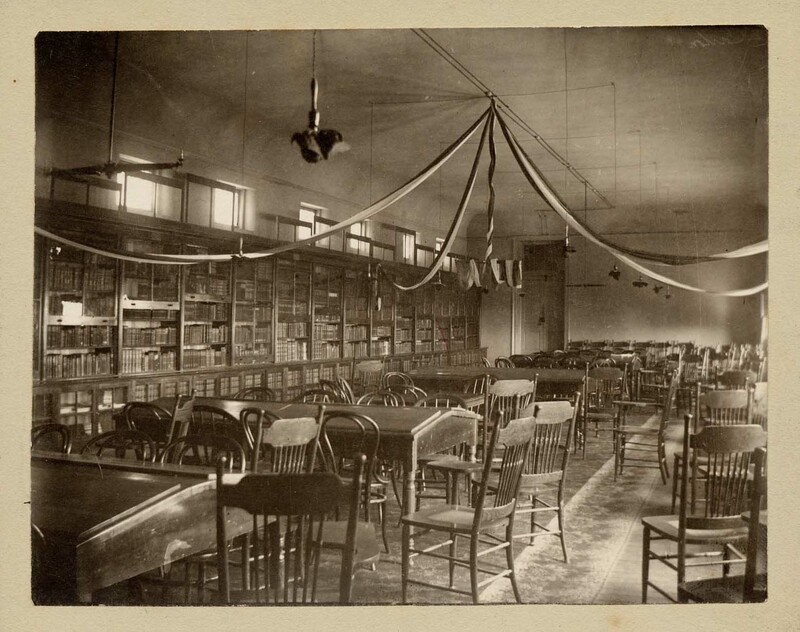 Then again in March of 1874, the faculty took up the cause of a college library when it resolved that “a well-selected and arranged library is indispensable to a literary institution,” and appointed a Library Committee to secure such a collection. The head of the committee was to be the Librarian, and was to report to the faculty the progress of the Library. The first annual report of the Librarian was recorded June 15, 1874, in the Faculty Minutes. By 1879, over 4,000 volumes were available to the College’s students, still mostly from the libraries of Ward and other professors. The young woman pictured in kimono is Misao Tsune Hirata, Class of 1890, from Yokohama, Japan. She was Western Maryland College's first exchange student. 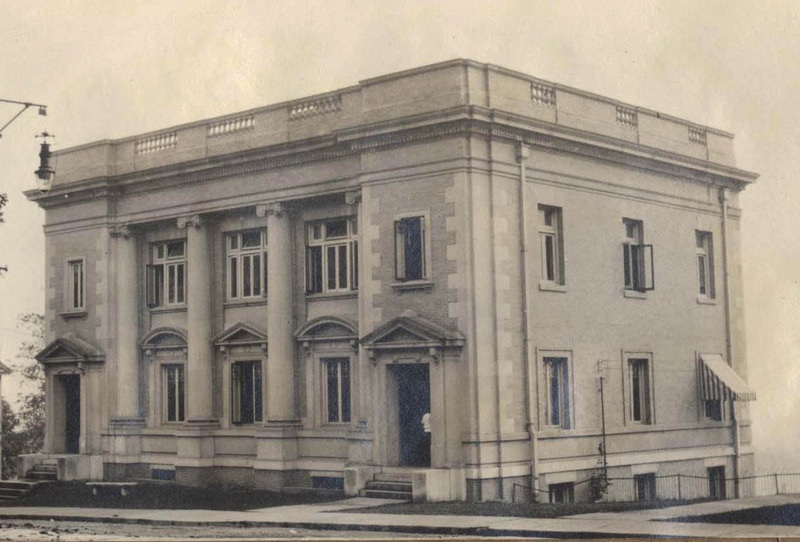 When Hering Hall was erected in 1890, a second floor room of over 2,600 square with stacks against the wall and a reading area was provided for a Library, and the number of volumes grew. Ward died in 1897, leaving over half his library to the College, providing an additional 3,000 volumes. With the growth of Library holdings and student’s need for extended hours, the College could no longer rely on a rotation of professors to act as librarians. In 1898, the first professional librarian, Lillian Hopkins, was hired. In 1906, College President Thomas H. Lewis went before the Board of Trustees to present an argument for a new Library. In the twenty years of his tenure, the College increased from eight to fourteen acres, four halls were added to the main building, and five new buildings were erected. A new Library was also necessary for the expanding College. The Library and Administration Building, now Peterson Hall, circa 1909. The Library and Administration Building, designed by Baltimore Architect Jackson Gott, opened in 1909 and served several purposes. On the main floor was an office for the College Treasurer, a Boardroom, two offices for the President, and a museum. The basement had rooms for the literary societies. The second floor contained the Library and included a large reading room adjoined by a stack room with a mezzanine for more stacks and space for over 25,000 volumes. 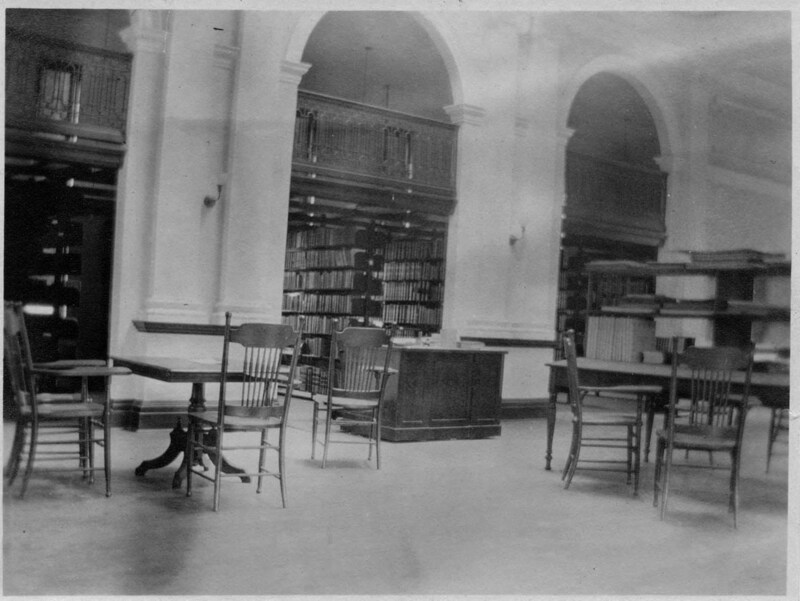 Old interior of the Library, date unknown. The Library continued to build collections and change. When the building was completed in 1909, students no longer learned by recitation; reading, discussion, and discovery were part of new teaching methods, and more books on more subjects were needed to keep up with their classes. By student demand, library books were circulated and evening hours were scheduled. Clara Lewis, Librarian from 1910-1919, sorted and cataloged the Library collection according to the Dewey Decimal system. Assistants who aided the Librarian were added in 1920, and by 1935, there were two Librarians and more assistants. In 1927, the Library began statistical reports to the American Library Association, annual reports to the College President in 1936, and in 1937, The Library Committee became a standing committee of the Faculty. As the Library grew, the President’s Offices, the Boardroom, and the Treasurer’s Office were reassigned to other buildings. Now-defunct literary societies no longer used the basement, and the building was refitted in 1939 to be the official Library. It was bursting at its seams eleven years later, when College Trustee Walter H. Davis bequeathed $257,000 toward a new College library. Hoover Library, photograph by Audrey Bodine, circa 1961-1975. 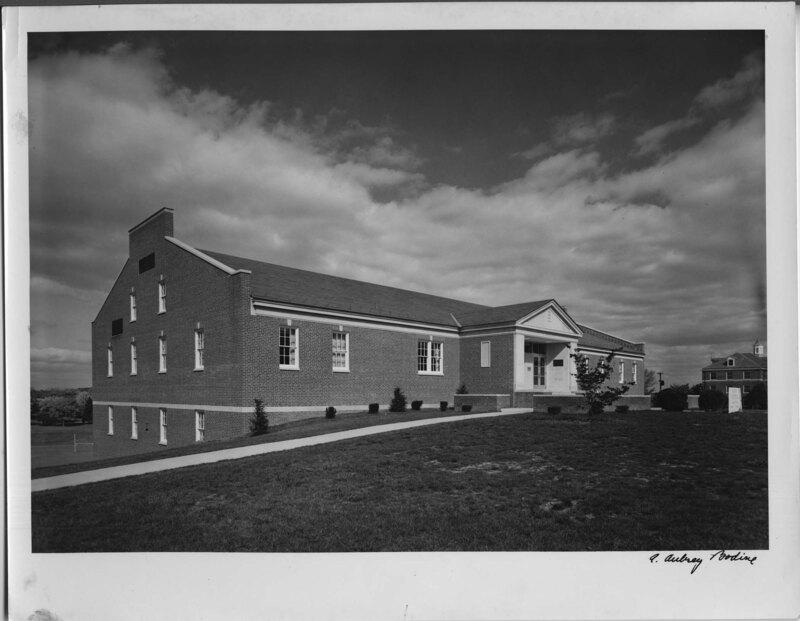 It took another decade, but ground was broken next to Baker Memorial Chapel for a new library in April of 1961. The building was dedicated in December of 1962, and L. Quincy Mumford, Librarian of Congress, spoke. Many of James T. Ward’s books were still on the shelves at this time. What was left of his original donation was pulled from circulation in 1963 and placed into Special Collections. In 1975, the library was named Hoover Library in recognition of Dr. Samuel and Elsie Hoover's dedication to College. Dr. Hoover was an active member of the Board of Trustees. Just over twenty years later, in April, 1985, new President Dr. Robert H. Chambers III stood before the Board at its annual meeting and argued for a larger library. The Board agreed, and on October 13, 1991, the dedication of the new Hoover Library was celebrated. This library, a renovation and expansion of the original Hoover Library, was double the capacity, able to hold over 300,000 volumes. It was designed by the Hillier Group, built by Henry Lewis Company, and featured on the front cover of the Library Journal December, 1992, architectural issue. It had comfortable study rooms, lounge chairs, and study carrels throughout the five floors of the building. Card catalogs were replaced by computers, and there were computer stations for students to work from. The staff of the library included five Librarians, including the Library Director, eight Staff, and many student workers. 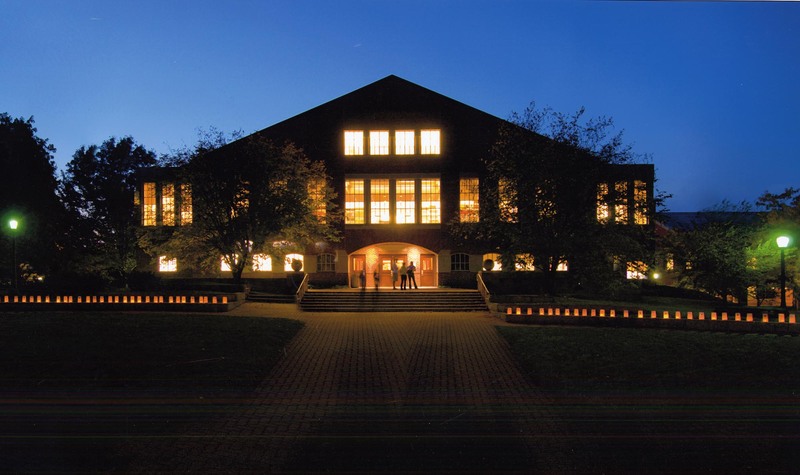 Hoover Library at night, circa 1991-present. Today, Hoover Library's facade has not changed much since its dedication in 1991, but the Library itself has. Wi-Fi has been added so students can use their laptops anywhere in the building. There are study rooms with computers and large flat screens allowing students to work in groups on a project. The area that once held reference books was refitted as an Information Commons with new computer equipment and modules, so students can configure their own work stations. Students can access the catalog, most periodicals, and databases from their laptops from any place they can connect to the internet. Would Ward be astounded by the changes? Yes, and yet he could still select a book from his own library, located in the Boardroom of Hoover Library, and thumb through its familiar pages.